Contemporary lines give the Rosharon Asbury Dining Room Collection a clean and beautiful look, and the smart style look will help you complete the dining room you've been dreaming about. What makes this set so special is that it's made from solid wood right here in the USA. The curved pedestal-style square legs bring a sense of strength and elegance to the room. You'll also love the beautiful grain the solid maple wood showcases under the catalyzed finish. Made in the USA out of solid maple wood with square curved legs. The catalyzed finish gives the wood a beautiful, glossy look. 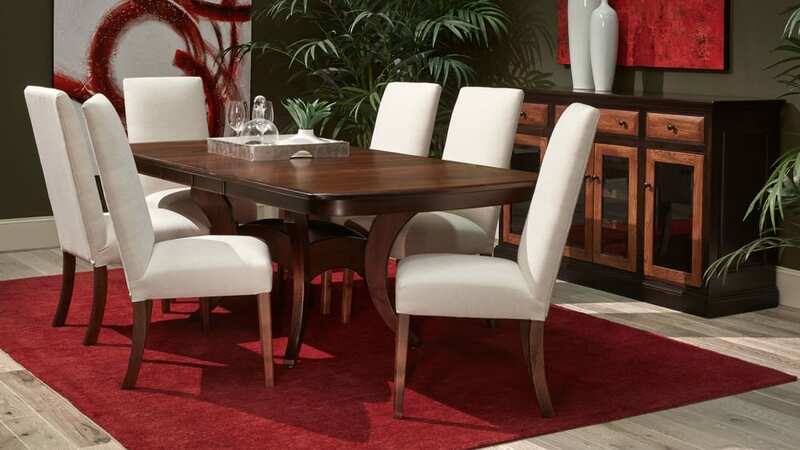 The contemporary style goes well with many other styles of wood furniture to complete your dining room decor. When you bring home the Rosharon Dining Room Collection, the clean and contemporary lines won't create a distraction from any of the other furniture you have in the room. This dining collection has the ability to stand on its own without overdoing it. This will be the easiest furniture selection you've ever made! At Gallery Furniture, we don't want to make you wait. So if you put in your order for the Rosharon Asbury Dining Room Collection TODAY, we'll make sure it gets delivered to your door TODAY.